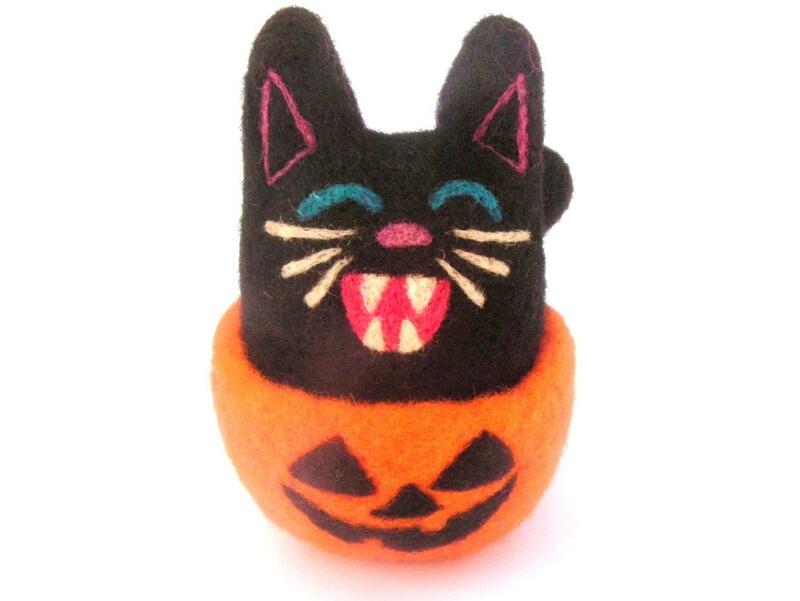 Today I’m going to share a tutorial for a needle felted Halloween Kitty. 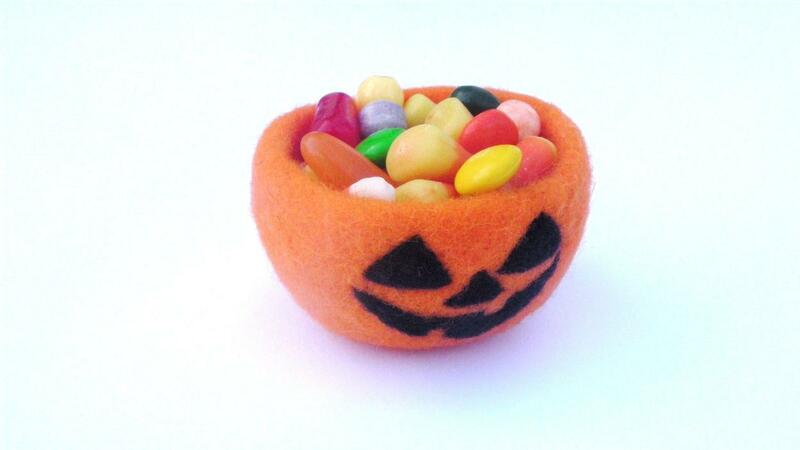 If you are interested in making the jack o’lantern, you can find the tutorial here! Good Luck. Start with a felted ball that is slightly oblong. 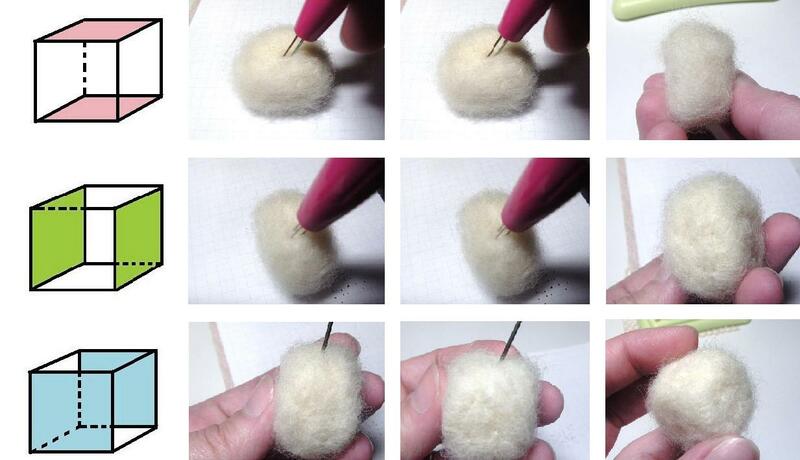 You can follow my tutorial on wet felted balls if necessary. 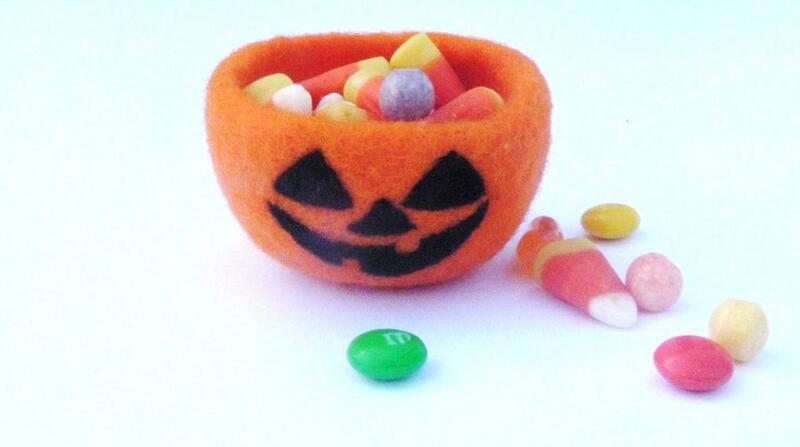 If the kitty will be sitting inside the jack-o-lantern, make sure that the felted ball sits inside the jack-o-lantern bowl and is about twice the height of the bowl. Felt the top and the bottom of the felted ball so that they are nearly flat! 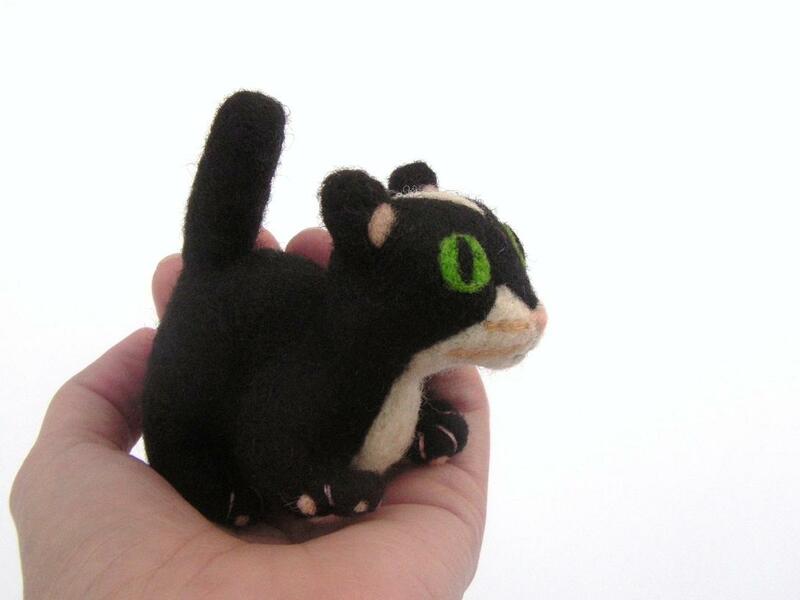 Next we will be needle felting a small ball. 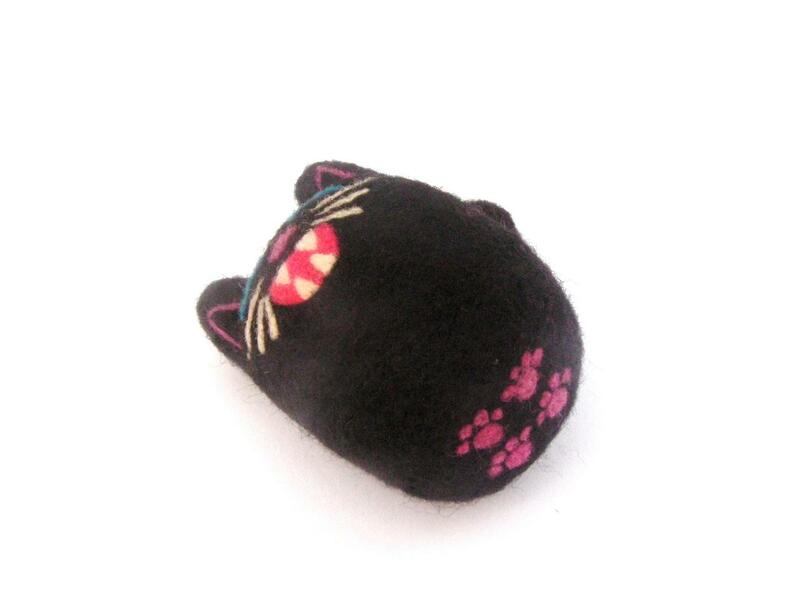 This small ball will later become two cat ears so be careful with the amount of wool used! A ball is very easy to felt. Simply lay out a tuft of wool, roll it up a bit, fold from the right, fold from the left, roll a bit more, fold from the right, and from the left, and continue in this fashion until all the wool is balled up. Then grab it by the tufty end and loosely felt the mass of wool so that a loose ball is created. Turn as you felt so that the “ball” shape is maintained and not flattened! Now we will be turning the felted ball into a cube. Just remember a cube has six sides and all will be well. Needle felt the top and bottom of the ball so that both are flat. Now there is a squished ball. Next, needle felt the right and left side until flat. And finally, needle felt the front and the back and the “cube” shape will start to emerge. 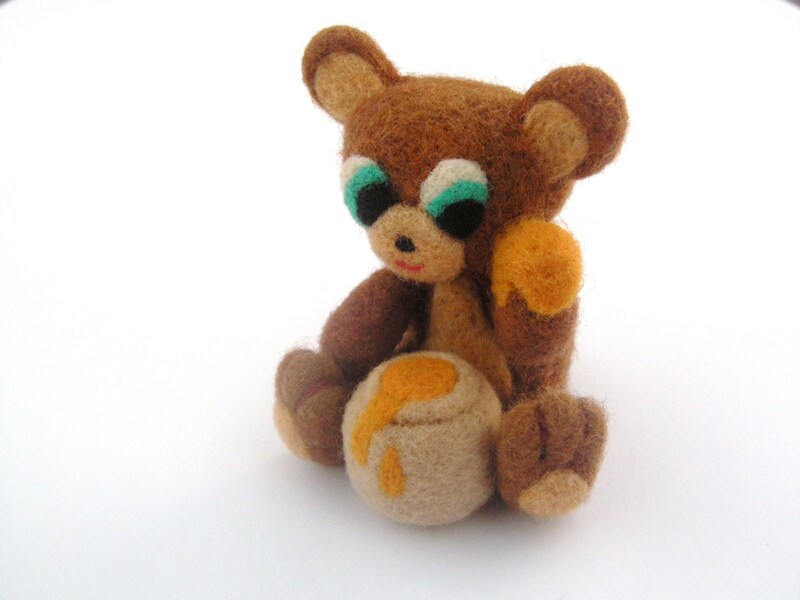 Now, needle felt the cube with a smaller size needle(a larger number). This will make the cube denser and straighten up the edges a bit. Once the cube is created. Cut it in half diagonally. This will create two 3-D triangles. These 3-dimensional triangles will become the cat ears. Next cover each triangle with black wool. Needle felt the black wool onto the white 3-D triangle, but leave the bottom of the triangle unfelted. This unfinished side will be used to attach the ear to the body in a later step! Now it is time to create the tail. Grab a tuft of black wool, lay it out, and roll it up as if packing away a sleeping bag. Needle felt this “roll” of wool, leaving one end unfelted. Turn as you felt, so that the roll remains smooth and round instead of a flat mess! The basic body parts have been created. To attach them: Spread out the unfinished edges of the tail and ears, hold or pin them in place, and needle felt the unfinished portions onto the body. Wrap the body in the main color, in this case black. Then needle felt it into place. 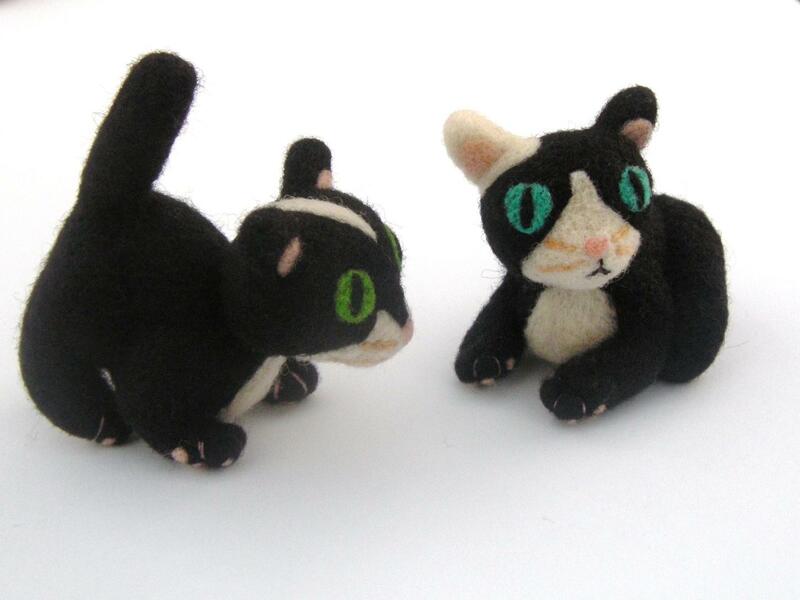 Needle felt the entire kitty project with a smaller needle( a larger number). This with smooth out any lumps and bumps. Now we are ready for the fun part . . . the details! Simply add an adorable face, and maybe some paws underneath. 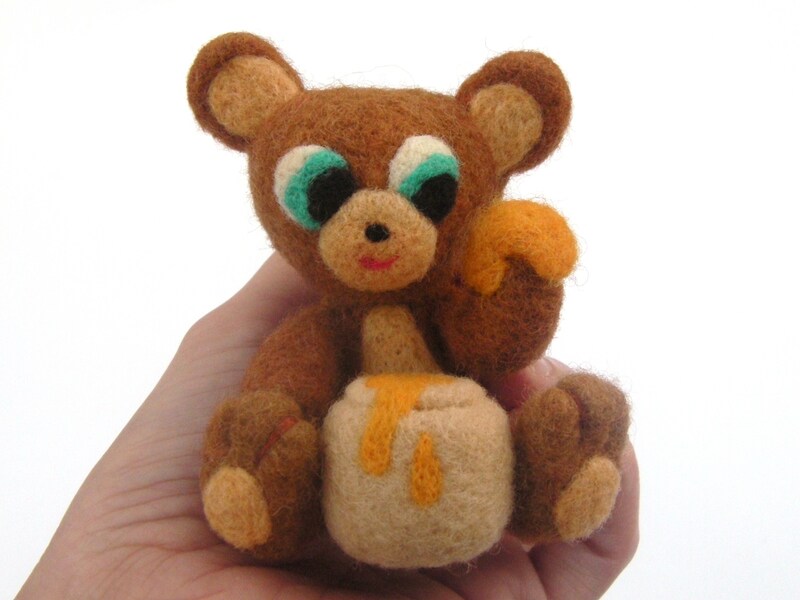 I have a tutorial on needle felting faces if you need some help! I know this was quite a long tutorial, but honestly it isn’t as hard as it looks! In a few short hours, the Halloween themed kitty will be complete. I think the little teeth are just adorable . . . I mean SCARY!!! If you have any questions or comments, feel free to share them. Happy Halloween!